The creator of the world-famous YorkyPud Wrap has opened an upstairs dining room at one of its York city centre branches after securing a new lease. York Roast Co became a global viral sensation after millions watched an online video showing the preparation of its wrap – roast meat, vegetables and gravy wrapped in a huge, flattened Yorkshire Pudding. Now the family-run company can accommodate even more visitors at its Stonegate shop after a £150,000 makeover to create the 30-seater dining area. The expansion came after York Roast Co reached agreement on a new lease for the Grade II-listed building with landlord The National Trust. York Roast Co was advised on the lease by York-based Langleys Solicitors. York Roast Co, which was founded in 2010, has further branches in Low Petergate, York, and Chester, Salisbury and Shrewsbury. Before its expansion, the Stonegate shop was the only one without a dining area. Wayne Chadwick, managing director, said: “The York weather is far from reliable so when it rains we need some seats! Our customers can now enjoy their meal in a comfortable and warm environment. “The building dates back to the 16th century so the conversion was sympathetic to this history and we made sure that all conservation and building regulations were carefully addressed. 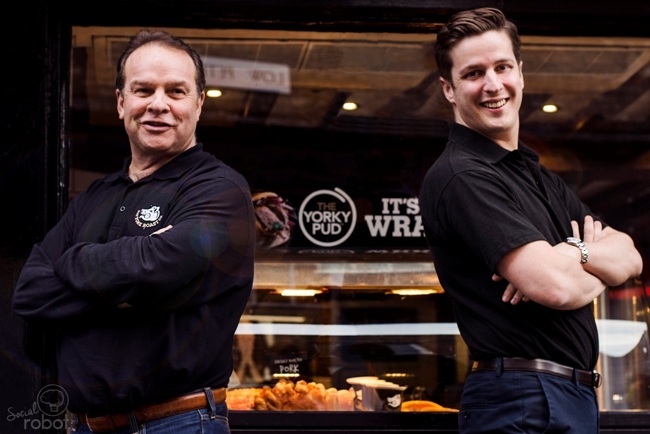 Wayne said the success of the YorkyPud Wrap had contributed to a 50 per cent growth in turnover for York Roast Co, which is expected to hit £3m this year. Amy Taylor, solicitor in the commercial property team at Langleys, said: “We were delighted to assist Wayne with his new lease at Stonegate. York Roast Co has long been known for the quality of its food.